For it is by God’s grace that you have been saved through faith. It is not the result of your own efforts. But God’s gift, so that no one can boast about it. Visiting Germany and learning more about Martin Luther, made me aware of how progressive and liberal his thinking was. The printing press promoted his ideas among the masses. Luther’s beliefs and leadership were instrumental pieces of the reformation puzzle. At the time ornate, gold-laden, breathtakingly beautiful churches were being built not to glorify God but to feed the ego of the clergy. Lavish, expensive, impressive churches were built by collecting indulgences from the very people who could least afford it. The poor were taught that they could free or reduce the time their dead relatives would spend in purgatory through these indulgences. Taking this money from people barely able to subsist seemed cruel and selfish to Luther. Luther’s radical ideas made sense and threatened the accepted practices of the church of his day. When Luther’s life was in peril, his supporters provided shelter at Wartburg Castle. 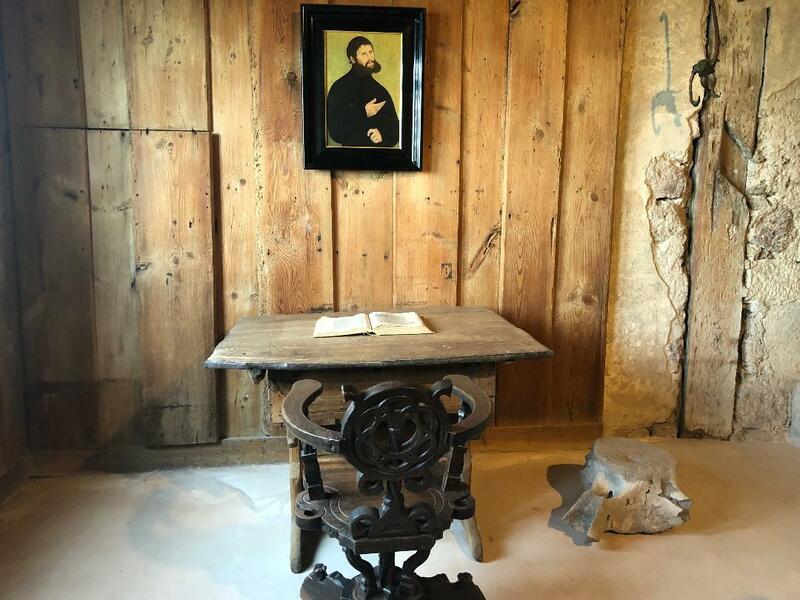 The Wartburg Castle provided a glimpse of just how few earthly materials Luther required to be inspired. A single bed, desk and chair furnished his room. His inspiration seemed to come from the Scriptures and his fire to love and serve God. A church built from his beliefs became a simple, quiet, humble place to pray, contemplate and experience God. The more I learned about Luther, the more I came to respect his bravery and endless courage to challenge powerful church practices. He continued to hold on to his beliefs even when threatened and excommunicated. Learning more about the reformation enhances my spiritual growth and makes me proud to be a Lutheran. As I grow spiritually, I hope to live our mission statement. I am thankful for the camaraderie; knowledge and bonds formed following Luther’s footsteps. Gracious, compassionate and loving God, Give me the strength to live simply and humbly for your glory. Continue to help me grow spiritually, accept your grace and serve you. Amen. Linda Splichal is a member of Sheridan’s Women’s Ministry Team. Linda is a retired elementary school teacher who has been a member of Sheridan since her college years. She is blessed with two children and three grandchildren. Linda’s plays golf, works for the Lower Platte South and is on the Event Staff at the University of Nebraska. Her ministry includes hospitality, visuals, women’s ministry and helping with funeral luncheons. She enjoys spending time with her family and friends.